Tail-biting is a problem that can occur at any stage in modern pig production. It is a serious welfare issue because it causes physical damage and leads to swelling, infection in the spine and ultimately lung abscesses or septicaemia. Tail-biting is a complex multi-issue problem but one of the main causes is due to frustration and boredom in barren systems. For further information on causes please refer to Information sheet 5 – Tail docking and Tail biting. Many factors need to be considered and adjusted before stopping tail-docking in your herd. It is important to ensure all steps in the preparation stage are taken before undergoing a small-scale pilot trial to stop tail-docking. The trial will inform you of potential difficulties and barriers to successfully operating without tail-docking. Refine your adjustments before proceeding and rolling out a no-tail-docking strategy across your herd. Compassion in World Farming's Food Business sector has produced a contingency plan with preparatory steps to help you move away from routine mutilations, such as tail-docking. PLEASE NOTE: No trial should be undertaken until staff are fully trained in the causes and recognition of tail biting and rearing conditions at a pen level are assessed with risks identified and minimised, before attempting to rear pigs without tail docking. This includes, but is not limited to, appropriate enrichment, ventilation, thermal comfort, and stocking density (space allowance). Draughts in the lying area. Variation in tail length i.e. a mixture of long and docked tails, or range of docked tail lengths within the group. Season (late winter/early spring) and air frost. Enrichment objects being fouled, at floor level or with poor accessibility (guidance notes on enrichment and manipulable materials, based on good practice seen during the study, is available from BPEX). Pigs being moved from straw to non-straw systems. Fouled drinkers (only found in 4% of pens, but highly significant association); this may indicate general management standard rather than a direct cause. Presence of straw, and being housed on straw throughout. Other factors include ensuring enrichment provides an activity level of at least 15% of the pig’s time, providing a space allowance of at least 1m2/100kg. Ensure all houses/pens in which the trial pigs will be reared, have been assessed and risks minimised appropriately. Remember all pigs in a pen must have entire tails – varying length increases the risk of tail biting. Ensure there is enough space on farm to be able to deal with separating/isolating pigs in the event of an outbreak. Where space on farm is limited, an agreement with a neighbouring farm should be sorted to ensure appropriate action can be taken if pigs need to be taken off-site, or an alternative solution must be found. The farm vet must be aware of and involved in the trial and provide input as necessary and be available for emergency advice. Your processor must be informed of the trial. Where possible arrange for early intake of pigs if a problem arises and negotiate or be prepared for potential penalties that may be set by the processor in relation to damaged tails. Once tail-lesions are present in a herd there is a risk of a tail-biting outbreak. Pigs should be observed daily for any indication of tail-biting, such as the presence of swollen or shorter tails, fresh blood or pigs chewing tails. 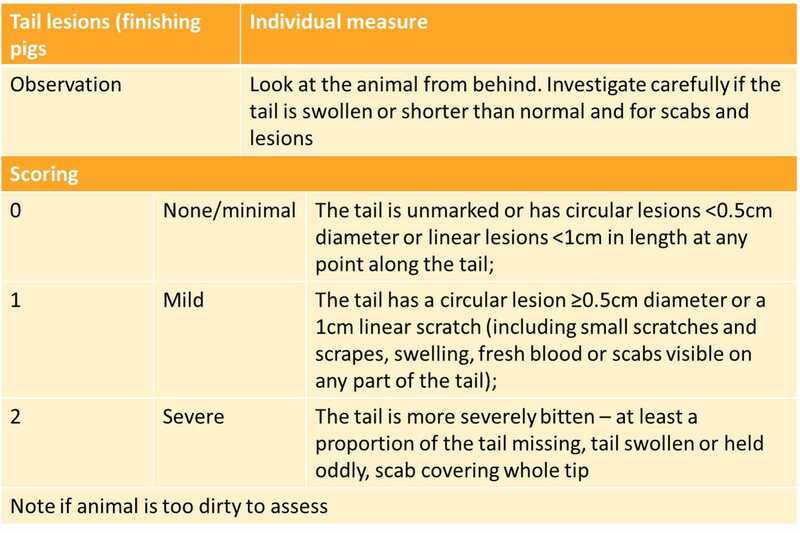 Assessing pigs regularly using the Assurewel tail-lesion scoring system should help monitor tail lesions within the herd (Table 1). You should be concerned by the presence of tail lesions, and because of the potential for an outbreak to develop, it is essential to have a contingency plan for if there is a pig with a severe lesion or several pigs with mild lesions within a pen. A contingency plan for the control of tail-biting involves assessing and adjusting the contributing factor/s, removing the tail biter/s and adding rooting and manipulable material. This step point plan should minimise the spread of the behaviour and ensure the welfare of the animals. The identification of tail-bitten pigs should be conducted daily. Behaviours in young pigs which are associated with tail-biting later in life include restlessness and damaging interest to tails and ears. 1. Identify the pig/s affected with tail lesions and isolate the animals in a hospital pen. Give appropriate treatment such as stopping the bleeding, treating the wound and giving a non-steroidal anti-inflammatory for the pain and to reduce swelling. 2. Identify the pig/s performing the tail biting behaviour and isolate them in a separate pen with enrichment such as straw, hay racks, wood and wood shavings. 3. 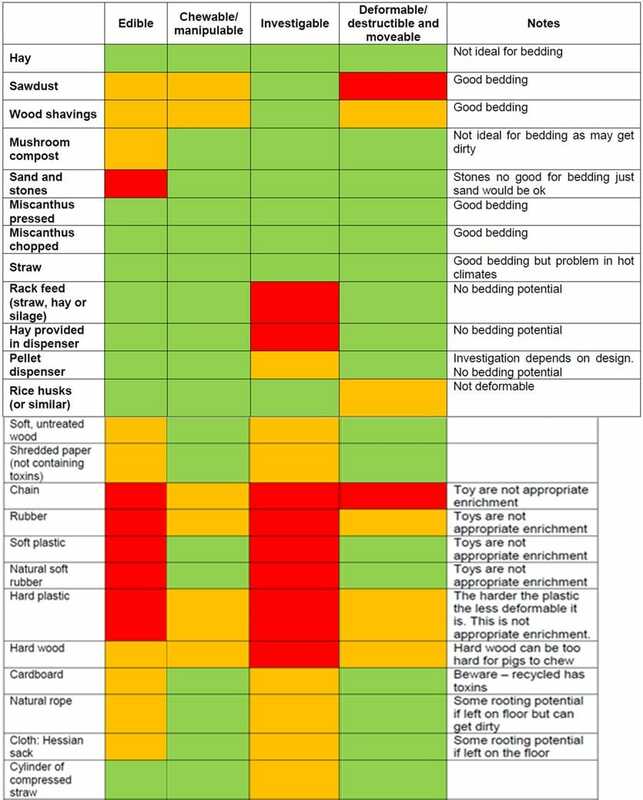 Provide the remaining pigs in the pen with as much novel enrichment (manipulable – edible, chewable, investigable and deformable and moveable) as possible, such as: straw, hay, mushroom compost, saw dust, risk husks and wood (see Table 2). The enrichment should occupy the pigs for a minimum of 20% of their time. The best enrichment material for ensuring occupancy of pigs is one that is edible, chewable/manipulable, investigable, deformable/destructible and moveable. It should be complex, changeable and ensure good hygiene. Material should occupy pigs for 20% of their time. Providing more than one material provides variety and can help to incorporate all the aspects needed for manipulable material provision. Enrichments are often limited by geography, and therefore locally available solutions may be required. Overall the materials provided should be edible, chewable, investigable and deformable/moveable; when all criteria are ticked, the enrichment is considered to be good overall e.g. risk husks and hay dispensers. 5. 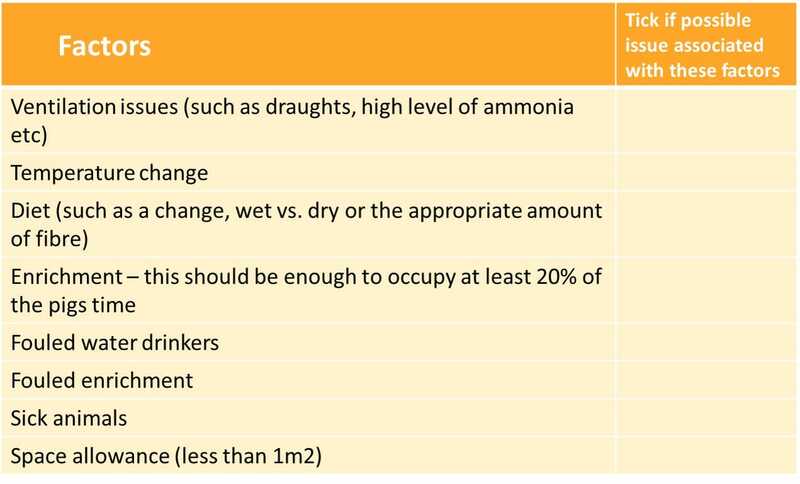 Once the risk factors are identified take the appropriate action to remedy the situation in the pen and consider conditions in other pens nearby, especially if there are ventilation, enrichment or stocking density issues. 6. In the event of an outbreak where tail docking is required for pigs within a tail biting pen, ensure tails are docked to a uniform length using pain relief. 7. STOP THE TRIAL if an outbreak occurs and reassess your risk factors and solutions before trialling again. The contents of this document are for information purposes only. Compassion in World Farming makes no express or implied guarantee that tail biting will not occur when trialling pigs with no tail docking under a contingency plan. Each situation is unique, and successful operation with intact tails is down to careful risk management in the individual operation. Any reliance you place on this plan is strictly at your own risk and Compassion in World Farming is not liable for any use that may be made of the information contained herein.